Orange Cranberry Chocolate Chip Cookies are the perfect holiday cookie with their delicious seasonal flavors! 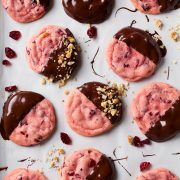 You get bright citrus, sweet cranberries and rich chocolate bits. What’s my favorite part of the holidays? The food, family, friends and the holiday parties of course! And would there be any holiday parties without the food? The more I become acquainted with food, the more I come to realize how much it has to offer. Not only does it give us the constant nourishment we need to live our daily lives but it brings us together. It builds friendships. It also opens a world of opportunity to experiment with exciting flavors and try new recipes. 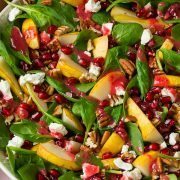 That’s one thing I love about food, it never has to be boring and there are limitless combinations of what can be created. Another great thing about food is its array of seasonal flavors. I like how there is a rotation of fresh seasonal produce to keep things exciting. Winter can seem to lack quite as much abundance of fresh fruit, but the one fruit I’m glad I can always count on during the Christmas season is the plethora of perfectly ripe, deliciously sweet Navel oranges (the kind that don’t lead me to pulling a sour face immediately after sinking my teeth into the first bite). When you really get a good orange, it’s so juicy and sweet it could nearly pass as candy. 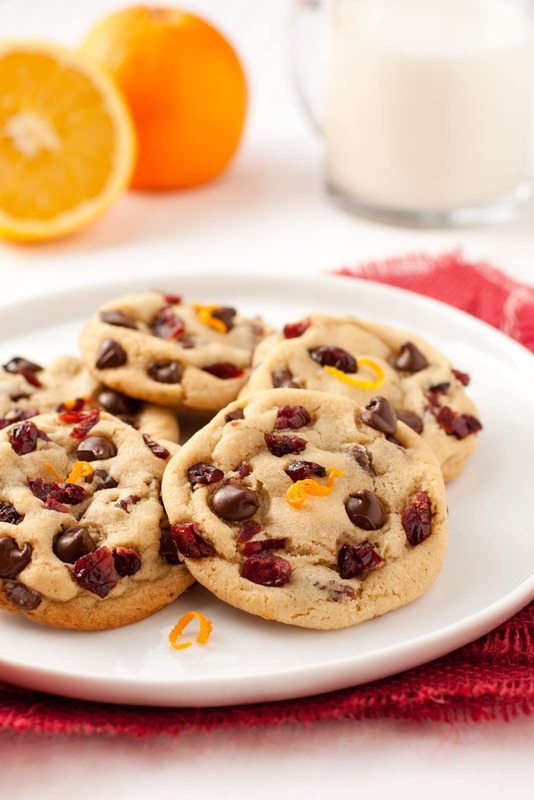 Oranges are definitely my favorite citrus fruit and their flavor complements a chocolate chip cookie like no other. 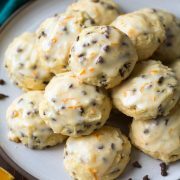 The citrus-y zip hugs the semi-sweet chocolate chips. These cookies are like those chocolate oranges you buy around the holidays, but in thick and chewy cookie form! 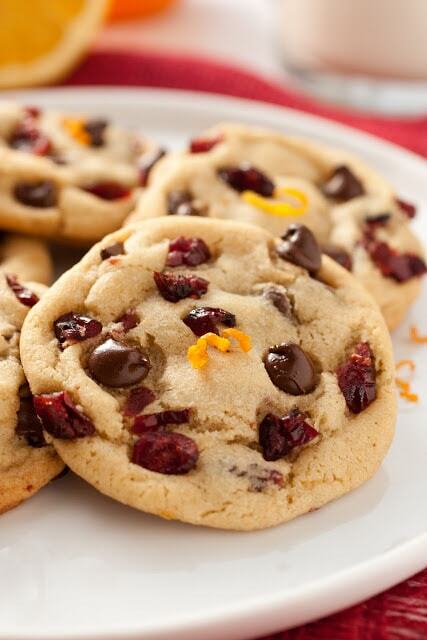 Then when you add cranberries into the equation, you’ll feel like this cookie is the season’s best friend. If you ask me, cranberry, orange and chocolate were meant to be together. This cookie is perfect to bake and give as a gift, because how many people do you know that don’t like chocolate chip cookies? And how fun would it be to give a chocolate chip cookie that had such a flavorful and exciting twist? I know I’d be happy to get a plateful. Enjoy! The perfect holiday cookie with their delicious seasonal flavors! You get bright citrus, sweet cranberries and rich chocolate bits. Preheat oven to 375 degrees. In a mixing bowl, whisk together flour, cornstarch, baking powder, baking soda and salt. In the bowl of an electric stand mixer fitted with paddle attachment, whip together butter, light-brown sugar, granulated sugar and orange zest on medium-high speed until pale and fluffy about 4 minutes. Mix in egg and egg yolk. Stir in orange extract and vanilla extract. With mixer set on low speed, slowly add in dry ingredients and mix just until combine. Mix in chocolate chips and cranberries (if you want them to look like those pictured, I set aside some of the chocolate chips and cranberries to gently press into the top of the cookie dough balls before baking). Scoop dough out 2 Tbsp at a time and gently roll into balls, then place onto Silpat lined cookie sheets spacing them 2-inches apart. Bake in preheated oven about 10 - 11 minutes. Allow to cool on cookie sheet two minutes before transferring to a wire rack to cool. Store in an airtight container. *Orange extract can be found near the vanilla extract in most grocery stores or supermarkets. For more recipes in the 12 Days of Cookies series, follow along on Twitter with the hashtag #BlogHerCookies. This post is part of the BlogHer 12 Days of Cookies editorial series. Our advertisers do not produce or review editorial content. This post is made possible by Bank of America and BlogHer.